First, I realized that I never bothered to mention that the Moffat Route will be closing down this summer for about six weeks to undergo a maintenance blitz. The goal is to do some very serious trackwork between C&S Junction (Denver) and Bond, CO. Massive amounts of concrete ties and track renewal will be done during daylight hours, with the line (usually) reconnected at night to allow an armada of freight to pass over the line during the evening hours. The last I've heard is that it should start around 26-Jun-2004, and continue through early August. Amtrak 5 and 6 will be routed via UP through Wyoming during this time, and the summer Ski Train has been annulled. Second, the rumor mill says UP is apparently going forward with plans to realign Utah Junction. What I've heard says that the BNSF Front Range sub will be dropped a number of feet near Utah Jct. to allow a new connection to fly over it, joining the Moffat to the Belt Line. Pecos will remain an at-grade crossing, as the rumor mill also says that funding was not available to grade separate the crossing. This could be right or completely bogus, but the start date I've heard for preliminary work is sometime very, very soon. In the odd-but-true category, Steve Walden passed along this item from the Denver Post stating that the Colorado, Kansas & Pacific intends to pursue another five year lease on the Towner Line, the ex-MoPac main east from Pueblo. This is Rio Grande related, as the DRGW used trackage rights over this line to reach Kansas City after the UP/WP/MP mergers. The Glenwood Canyon derailment area was opened for train traffic on Wednesday, 18-Feb-2004. Tom McConnell reported the first trains through the area at 0600h. The cause was apparently found, in the end, to be a broken rail, possibly caused by a rockslide. "Sometime late Friday or early Saturday morning, our office at the Brooklyn Roundhouse was broken into. A few of the usual things were stolen, a VCR, a radio Boom-box, a few dollars petty cash and some pop. On a close investigation we found that the main steam gage from the SP&S 700 steam locomotive was taken from a cabinet in the office. Although others can be made to fit, this is an irreplacable, one of a kind gauge. It is fairly large, probably 20+ pounds and has a sketch of the locomotive as well as the SP&S logo etched on the face. I will post a picture of this guage shortly." Adding to what's already been a bad week on the former Rio Grande, I just noticed that Bruce Collins and Tom McConnell have reported (on the DRGW list) the derailment of an eastbound coal train in Glenwood Canyon. The incident occurred just west of West Grizzly (MP 655). About fifteen cars behind the lead power (UP 6637 in front), about forty cars are off the track, in addition to the swing helpers (UP 6612 and 8149). Nothing is in the river yet, but Tom reports that 6612 is perched rather precariously on the ledge that supports the tracks. Update (2/15 - 1645h): Robert Harmen of GJ reports on the DRGW list that Amtrak 6 (powered by 158 and 136) was turned at Grand Junction. Passengers are being bussed to Denver. Also, a wreck train, powered by a patched SP AC and UP 6237, is prepared for a run east to the site. Bruce C. has also posted a few photos over on Trainorders here, for those of you with T/O access. 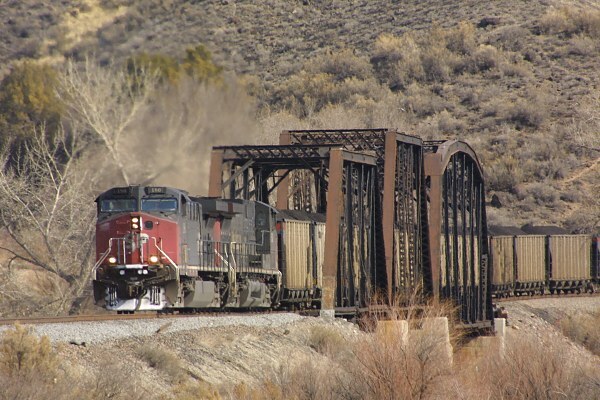 Sometime around 1100h today (Mon, 9-Feb-2004), UP suffered a derailment on the North Fork that damaged the Gunnison River bridge just west of Austin, CO. Based on a post by C. Hufman on the DRGW list, several coal cars derailed and had broken through some of the bridge truss members and were still being restrained by others, so they're more or less jack-knifed between the bits. For those unfamiliar with the bridge, see this photo of a loaded coal train, taken during Feb 2002.